Instead of pushing for a democracy, Britain pushed for a monarchy and helped establish Jordan as one in 1923. They felt they owed Emir Abdullah (1882-20 July 1951), 2nd son of the Sherif Hussein bin Ali,of Saudi Arabia, who asked to be a king for his fighting help in WWI. After all, he had been a part of the Ottoman Empire legislature's ruling class. The Brits understand things like that. Abdullah was pretty clever having been educated in Turkey. He talked his father into become the Grand Sherif of Mecca. He became the King of Transjordan. Britain had also made a deal with Jews through the Balfour Doctrine at the same time who also had helped Britain and her allies to win the war with their fighters, but mostly by Chaim Weizmann's invention of increasing the capacity of their weaponry. Britain had also taken on the responsibility of creating the Jewish Homeland, something decided through the League of Nations that was signed in agreement by all the countries in the world at that time by accepting the mandate. Jordan became the pet project of Britain which was under the rule of King Abdullah and assisted them in many ways. Britain trained military units of Egypt, Saudi Arabia, Oman, Iraq, the Persian Gulf states and Jordan, but Jordan held special status with them and saw to it that they continued the special British pattern well after WWII. It was British officers who directed Jordanian military and paramilitary units. Perhaps with Britain's off-stage help, King Hussein and his Royal Hashemite Kingdom of Jordan have managed to survive since Britain acted as their tutor. Britain had made a private commitment to assist them. They helped to establish after WWI the Jordanian border patrol which led to create the Royal Jordanian Guard and Arab Legion under Glubb Pasha. Britain was looking out for their own interests since the oil pipelines from Kirkuk and a later Trans-Arabian Pipe Line from Saudi Arabia put Jordan in the right position for oil exports. It was also strategically in the right spot to help Britain defend the Suez Canal and Red Sea zone. Jordan helped them carry out their Palestinian mandate that way, they told themselves. This desert kingdom was a very special British client and of high importance to the British foreign office. In 1948, the UN had tried to get the Arabs to accept their partition of Palestine and establish their own state like Israel was doing, but the Arabs refused, intending to take all of Palestine eventually, not settle for half of it. 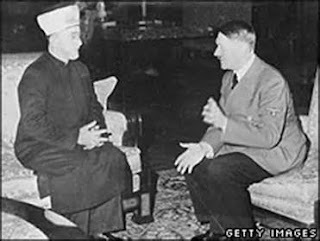 It's possible the Brits were backing off from seeing the Palestinians create a Palestinian state headed by the Grand Mufti of Jerusalem, Mohammad Amin al-Husayni, born in Jerusalem in 1893, son of the Mufti of Jerusalem, the richest and most powerful clan in the Ottoman Empire. He was an Arab who was from the land for several generations. "In the lead-up to the 1948 War against Israel, Husseini opposed both the 1947 UN Partition Plan and King Abdullah's designs to annex the Arab part of British Mandatory Palestine to Jordan. He and King Abdullah were related to each other but opponents. The Grand Mufti, Al-Husseini, was a new militant Palestinian Arab with nationalism in his being which was a new feeling among the Arabs. Once he was in power, he began a campaign of terror and intimidation against all opposed to his rule and policies. He killed Jews at every opportunity, and also eliminated Arabs who didn't support his violence. He wouldn't negotiate or make any kind of compromise in the name of peace. He later went on to make pacts with Hitler against the Jews. Originally the UN had planned to make Jerusalem an international city, but King Abdullah I of Jordan went ahead and on his own without anyone's permission, annexed half of Jerusalem and all of the Palestinian highlands many call the West Bank, which are part of the original Jewish lands of Israel and Judah of which Samaria was the capital and surrounding land of Israel after the creation of Judah and was part and parcel of their promised Jewish Homeland. When the king did this illegal act, the UN just looked the other way. By doing this, he had added this fertile land of the West Bank of the Jordan River to his Hashemite Kingdom and more importantly, increased the population of Jordan by one million people. Now Jordan became physically very close to the new state of Israel since the border between the two was a haphazardly drawn one in the countryside and the streets and alleys of Jerusalem. Two-thirds of the population of Jordan were now Palestinians. There was a difference between them and the Bedouin Arabs, nomadic desert dwellers, who lived on the East Bank of the Jordan River, for the Palestinians were better educated and more politically aware of their position. The Palestinian Arabs saw how King Abdullah manipulated and took land and they then thought how they could do the same thing. So in July 1951, one of the Palestinians assassinated King Abdullah while he was in the Mosque of Aqsa in Jerusalem. This was a case of jealousy of what Jordan's king had accomplished and he and his people coveted it. After, all, there was this class difference between them, and they couldn't let nomads take over and be so successful. Talal, Abdullah's son stepped into the kingship position but then abdicated due to illness which allowed his 18 year old son, Hussein to become king. He had his hands full of strife between the Palestinian Arabs and the Jordanian Bedouins. Then Nasser of Egypt rose to power, and everyone thought he would overpower the Israelis so that they could take over their land. Hussein found his position was not that easy and decided not to join the United Arabs or make peace with Israel without being dethroned by his angry coveting subjects. He became afraid of being attacked by the UAR (United Arab Republic) which would be the open door for Israel to get their West Bank back. At the same time, Hussein was taking money for military and economic aid from the USA which the Palestinian Arabs resented but without it, couldn't stay in power for long. The Iraqis had a revolution in 1958, putting Hussein in more danger. He cried out to his friend, Britain and 2,000 British troops came to protect Jordan against the other Arab nations. The Arabs of UAR (heads of the Arab States) met in Cairo in 1964 and approved making the Palestinians a political entity and called them the Palestinian Liberation Organization (PLO). This was a conglomeration of factions with the biggest being Fatah under Yasser Arafat who became their leader. Others were the Popular Front for the Liberation of Palestine (PFLP), and the Democratic Popular Front for the Liberation of Palestine (DPELP). The Arab nations supported them by giving the PLO the funds to work with. Most all the Palestinians were actually living right in Jordan which made 2 armies within its borders; one led by King Hussein and the other by Arafat. This made Jordan the staging area for the many attacks on Israel's land, just like Gaza assumed today. This resulted in Israeli retaliations, of course. There was a Palestinian village called Karameh on the east bank of the Jordan River that had become a terrorist stronghold. In March 1968 Israel retaliated and hit it resulting in the UN blaming Israel but not the Palestinians who were attacking Israelis from there. The Arabs used this "blame the victim" as a cause celebre, a psychological and a military victory for the PLA who were defending the village. Now the PLO's prestige skyrocketed and this led to more of the same; airplane heists, political murders like killing the Israeli athletes in the 1976 Munich Olympics. The Palestinian Arabs now concluded that only a disaster or an armed confrontation would make Europeans and Americans feel sorry for them. Violent deeds were the key to their success! The world didn't really seem to join their thinking so they went onto 1970's Black September in Jordan. It was then that King Hussein had had enough of their free-wheeling control of Amman, his capital. They had actually taken over Jordan, he felt. The king had the superior armed forces and the assistance of Britain and the USA. Syria and Egypt were silent, so he went about crushing the PLO leadership. In the act, hundreds of Palestinians were killed and thousands fled to Lebanon and Syria. The king had decided to win back his kingship powers and he closed the door to anymore cooperation with them. At any rate, the Arabs of the Middle East again attacked Israel on their most sacred holy day, a day when they were fasting and attending a whole day in the synagogue asking G-d for forgiveness, Yom Kippur in October 1973. Israel begged Jordan not to join in, but they weakened and wound up playing a rather passive role this time. This angered Egypt and Syria who also held against King Hussein the fact that he played an active part in crushing the Marxist-Leninist Dhofari uprising against the Sultan of Oman so why didn't he fight more against Israel! A Rabat Conference was held in October 1974 making the sole rep of the Palestinians conferred upon Arafat. Arafat, now with too much confidence, pleaded brazenly in the UN in November 1974. He wound up with observer status for his state he had not yet accepted. Arafat in 1983 tried to consider a possible federation of a joint Palestine-Jordan state. Hussein weakened by going along with the PLO status and like the others, condemned Sadat of Egypt for visiting Jerusalem in 1977 and the Camp David Accords of 1979. This was following the Beirut and Tripoli evacuations. However, even today when approached about taking more Palestinians into his country, the King of Jordan is adamant against the idea. There are so many Palestinians living in Jordan that it is actually a monarchy run by the Beduin Hashemite kingdom with a population of 5 million mostly Palestinian Arabs. Today's King Abdullah II bin Al-Hussein has married a Palestinian girl, now called Queen Rania Al Abdullah. Jordan has been a dependent state since its inception. The Arab states have been conferring $1.25 billion annually since 1978 but decreased it to $850 million in 1983. He is trapped and can't act on his own freely. It's been dependent on the USA militarily for arms. 56 US senators signed a resolution against selling arms to Jordan finally because it has been an enemy of Israel. Politically, he has been caught between Israel and Syria, one of the major Israel attackers in 73. Syria gets its weapons from Russia and Israel gets theirs from the USA. Today, Arafat has been replaced by Abbas of Fatah (formerly called the PLO). He is dickering with Israel and has pledged to stay in for 9 months of talks. His goal is to create Palestine out of Judah and Samaria and Jerusalem. We still have his other half left to deal with, the rest of the Palestinians led by Hamas, a declared terrorist group who have sworn never to make peace and who constantly shoot rockets, mortars and missiles into southern Israel, Eilat and anyplace their weapons can reach so far. Only a handful of the original Arabs were from Palestine. Most all came into the area from the surrounding lands looking for work in the 1880's when Jews from Russia came, escaping pogroms and wishing to return to their roots. Arabs were scarce in the land when Mark Twain and his contingent toured the Middle East. in February, 1867. The average Arab considered themselves to be Syrian Arabs. They had no burning desire or need for a state of their own, only decent wages. As Theodore H. White put it, to understand what is happening in the Middle East is to begin with its past. Joan Peters, in her research, has traced the history to the present with unmatched skill. I'm afraid this has not been a strong requirement for government involvement from any other country dealing with the peace table and Israel and the Palestinians. Without in-depth knowledge, drastic mistakes have already been assumed as far as I can see. Where many men of the West haven't clamored for political positions of ruling, it seems that there is no end to men who have yearned for this position in the East. Israel is looking at a next door neighbor already made up of Palestinians, a new one taking over the original Jewish lands of belonging to Israel and Judah and a despicable enemy in Gaza who will never make peace. That's 3 Palestine states! . How secure can Israel become against this horde? For the creation of a state means more money to create more weapons and even more voice in the UN than they have now. It means the peacock will have brighter feathers and will attract more than the Palestinians number today being they want to take in all other Palestinians who have settled elsewhere. For Israelis, this should be a nightmare. There has been no regard among the advisers to alter the hateful attitude of any of the Palestinians. All they teach is that they will take over Israel and that Jews of Israel are the enemy and are terrible people. There can be no "peace" between two different people this way. The Jewish Homeland was originally to include land east and west of the Jordan River. Israel has had to see it chopped apart where they have received 20% of the original promised land, and now they are expected to give up land again to the attackers that was Israel's in the first place won back after being brutally attacked in the 1967 war. To reward people who attack you with the land they covet just to see you destroyed is a first in this world. It could only happen to Israel because they are a Jewish country and have been vilified by the losers of the many battles that have gone on since 1948.